Details of the second Autumn Series event have been added to the fixture list. Choose from Odds and Evens score, traditional score or Orange courses. A gathering of ghouls, vampires and assorted Halloween characters enjoyed a fiendish frolic around the woods of the Silver Helm Scout Camp near Silverdale this evening. Results may be perused by following this link. 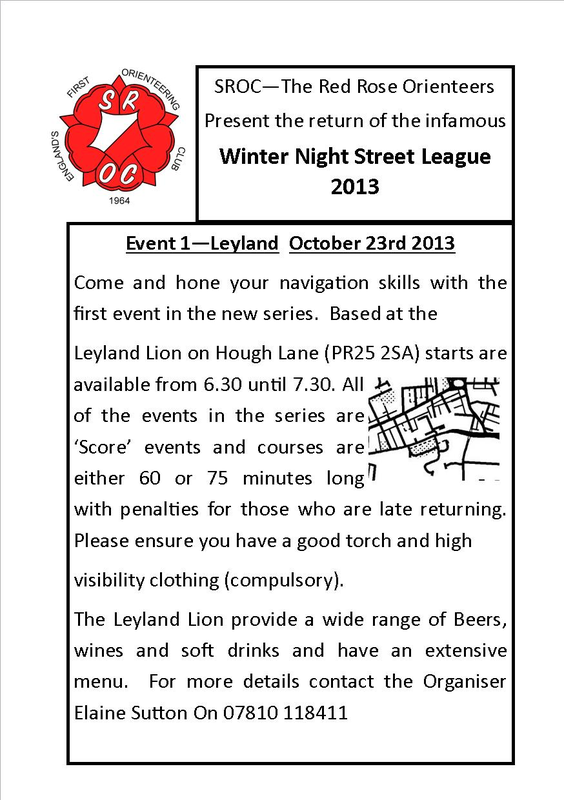 The 2013-2014 Street League started well last night with a return to the Leyland Lion. A few light showers did not hinder runners too much, provided they remembered to take a pencil rather than a pen with them! RouteGadget is now ready for your routes, and some notes on RG for Street League may be read here. RouteGadget for street events is s little different to "normal" O events where there is a file containing everyone's split times uploaded at the same time as the map. (Then all you do is pick your name from the list and draw your route). So here are some simple step by step instructions for adding your route to a street event RG. (Yes, I have been asked how it's done). RouteGadget for the warm up event is now ready to receive your routes. The results from Avenham and Broadgate are now on the web. Well done Tony for a storming run on what turned out to be a pleasant night for running as the rain stopped just in time. Looks like we are going to have a very competitive pairing now that Albert's daughter is running with him and keeping him on the 'straight and narrow'. Also good to see Tracey having a go on her own. Now it is on to the real thing. See you all at Leyland, Bob. Well done to all those who took part today. The results are on-line here. The next event is the Spook O on Friday 25th October. Don't miss it! Results for last Saturday's event may be viewed here. This flyer gives details for the first event in the new street league season. Don't forget the warm up event tomorrow! British Orienteering has announced the latest Development Squads today. Follow this link for the full article. SROC athletes who have been selected are Zoe Harding to the Elite Development Squad and Helen Ockenden to the Talent Development Squad. The popular SROC Spook O returns to Silver Helm near Silverdale on 25th October. Guaranteed fun for all the family! Check out the event flyer. We were pleased with the numbers entering and everyone seemed to enjoy themselves. One control placement was queried and on investigation it was decided to re-instate the competitor on the Orange course whose run had been affected. Congratulations to Laurence Johnson, winner of the World School Championships this summer, who found all the controls within the hour on the odds and evens course. Full results may be viewed here. LOC/WAROC are putting on a series of weekly night events on Wednesday evenings starting on November 6 in Bowness. Please see the LOC website for further details. Results for Saturday's event may be viewed here. Apologies to Joshua Edwards whose run on the White course was not recorded, this was our fault not his! A couple of you mispunched on the White course, in trying to correct your original mistake you punched another wrong control! Don’t worry, we all do it! We hope you all enjoyed the day and will be back for the next event on Saturday 12th October.